If you want to join the party, you must be in normal mode. - Press “P” on keyboard and choose “ต้องการเข้าร่วม” and type your leader name that you want to join and wait for leader’s acceptance. 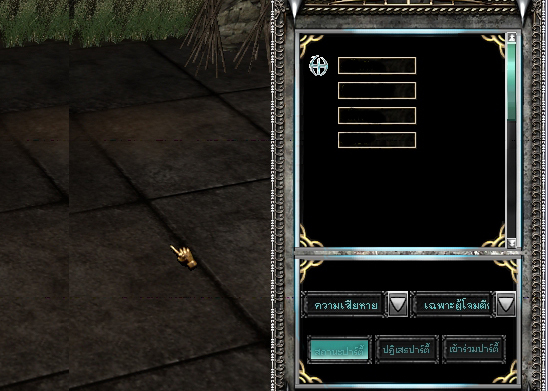 - Or hold right shift on the keyboard and click at the party leader that you want. It will have small window appear on the screen. Then you click party button and wait for leader’s acceptance. - When the party leader has already received the joining message, player can join the party. - When you have already joined the party, you will see white circle on your feet and players in the party. 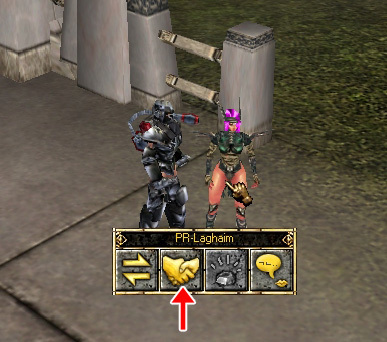 - If you want to see members in the party, press “P” to see all members in the party. - You can see your members LV. in the party by type “//party info and it will show members LV. in the party. - You will receive more 5% Exp when you have new member in the party. - You will receive more 5% Exp when the difference of LV. between member and member is 100 or higher. - You will receive 15% Exp from the monster if you are not attack them. - Party leader will receive more 10% Exp. There are 5 types of item share. - First player who attack monster will receive item. - First player who keep item will receive the item. - Item will random to member in party. - Only party leader can keep item. - Share item by start at party leader. - You can see the other health point in the party. - Input player name you want to have party with. - Party leader can appoint member to be the leader.